This story, on the release of “tank” or unpasteurized (North American) Budweiser in Quebec, got virtually no comment in the blogosphere that I saw. Mass-market products like Budweiser excite no particular attention among the beer commentariat, justly so in view of their lacklustre, high malt-adjunct taste. Yet this move in Quebec, especially if it heralds a similar launch in other North American centres, is of interest both on historical and, at least potentially, palate grounds. It’s historically interesting because into the 1970s and 80s most draft beer in North America was not pasteurized. Many sources confirm this, indeed it was a defining trait of “draft” that it was not pasteurized and had to be kept cold with a relatively short life span. The “new” tank Budweiser in Quebec is allowed only a two-week life span. 1970s draft beer was invariably filtered, sometimes in a prolonged process to reduce the chance of micro-biological instability, but pasteurization of draft beer was not usual, with some exceptions. Beer exported a distance, say Guinness Stout or Watney’s Red Barrel, was pasteurized. Anchor Steam Beer has always been flash-pasteurized since Fritz Maytag overhauled operations from the late 1960s. The flash method is less invasive as it subjects the beer to a higher temperature than traditional tunnel pasteurization but for a much shorter time. “Keg” beer in the U.K. and Ireland then even for the domestic market increasingly was pasteurized, as the two brands mentioned. At some point here, flash-pasteurization became the norm for most mass-market draft. All Labatt-brewed draft beer is, I’ve been told, pasteurized, so this Quebec initiative is a departure albeit simply a return to standard practice as viewed historically. Moosehead Brewery in Canada has a commendably long discussion of pasteurization, here, which is similar in its arguments to Anchor’s. Moosehead states however that flavour can be impacted, particularly hop character, but opines that adjustments can be made at the brewery to compensate. 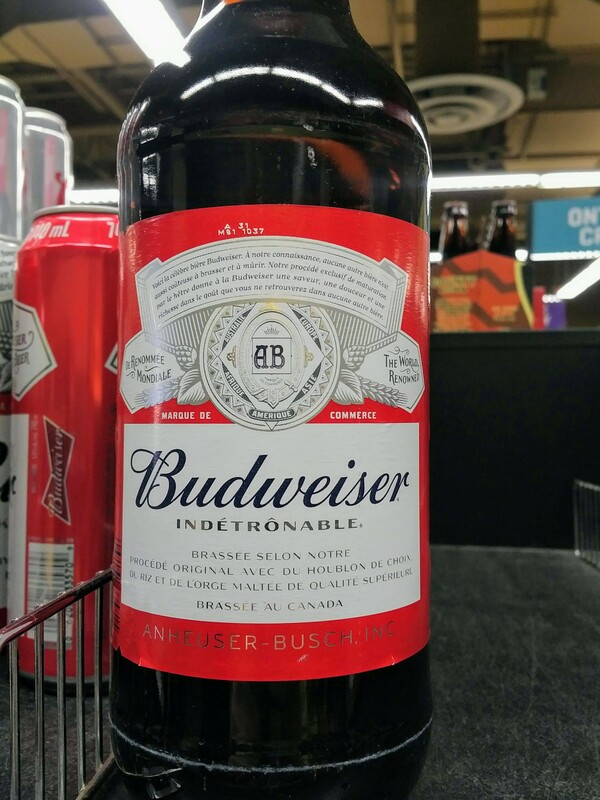 Yet, the unpasteurized Budweiser now on display in Quebec is being touted as having a special character due to no pasteurization. The freshness is emphasized, but the implication clearly is that sensory characteristics – taste – are boosted. Having tasted unpasteurized Pilsner Urquell recently in London, I can state it is considerably better than the regular, pasteurized draft, itself no duff performer in the beer stakes. As to North American Budweiser, its fairly lean, starchy palate may resist improvement through deleting the pasteurization step, but I’d like to try it to see. You never know. Perhaps in time, all mass-market domestic draft will return to unpasteurized form. If so, all to the good as, in the view of the committed beer fans I know, these products rate far below the typical craft palate in quality. N.B. As far as I am aware, draft Coors and Coors Light, and the bottled and canned forms for that matter, are not pasteurized in the U.S., but are in Canada. Conversely, draft Goose Island IPA, say, a craft-style brand of AB InBev/Labatt, is pasteurized in Canada as is Mill St Tankhouse. A switch to no-pasteurization, if that ever happens, will only increase the merits of the craft-style brands, in other words.